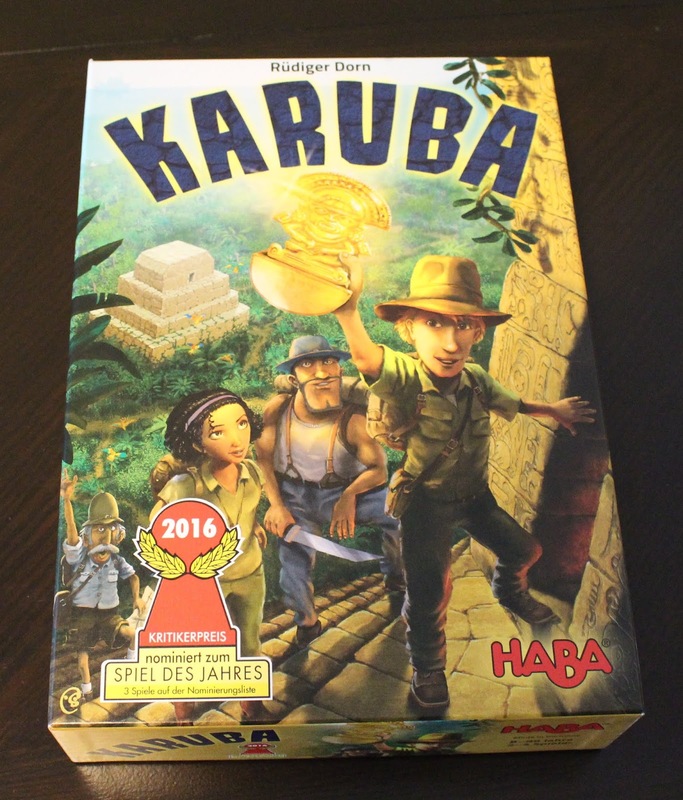 This week we are taking a look at Karuba, a tile placement game where players forge pathways through the jungle and race to be the first to explore ancient temples. The first player to a temple will get the most victory points, but careful, misplaced tiles can lead to stranded meeples and an easy victory for your opponents. 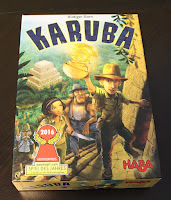 Karuba is an easy, quick to learn game great for both new and experienced gamers. Players grab a board and the corresponding tiles, meeples, and temples. Players then decide on the position of the temples and meeples based on a few caveats and how easy or difficult they want to make the game. A player will then randomly select a tile, read out the number and all players will play that specific tile. Players can use tiles in one of two ways, they can place them on the board or discard them to move a meeple along a jungle path towards a temple. The gameplay is pretty simple but things can become difficult if you don't get a path type you are looking for or you place a tile wrong. This can even result in a meeple being stuck in the jungle - sorry little purple meeple, I didn't mean to trap you... Other times you will have created the perfect path to all of the temples but run out of tiles before you can make it to the temples, making time/tile management a consideration during this game. We initially bought this game as we were interested in the mechanic to help with designing our own game but it has quickly become a house favorite. Due to its limited rules, easy mechanics, and quick setup it also works as a great gateway game. Other nice things about the game include the quality of components, and that game-play and time doesn't change with the addition of more players. While the lack of player interaction may limit the appeal for some players, I kind of enjoy it. One of my favorite things about the game is looking at everyone's maps at the end, despite having the same exact setup and the same tile order, the paths are always so different! Overall Karuba is a fun game that likely would have appeared on our games-o-lution challenge if we had picked up this game earlier.